It's been over 3 weeks now since we've been back and things are going great. We have our moments, as any family does, some maybe unique to adoption, some maybe just pre-teen and sibling things. Gertrude really likes school and she has a wonderful teacher. She also is riding the bus now and buying some school lunches. She is feeling like an official American student now! Her English teacher, who she sees every day for 45 minutes, said she is doing GREAT. She did not expect that she would be able to read as well as she does already. She has a ways to go, but she is very smart and very eager to learn. Fortunately, Gertrude is the only student in 4th grade at her school that needs the "English as a 2nd Language" sessions so she has one on one time with the teacher, Amy. Amy has one class at another school with 8 students in it. So, we are very blessed here too. We are going to Michigan for spring break to visit my mom and family. They have never met Gertrude and have not seen us in over a year so this will be a special trip. Only us girls are going. Scott has to stay home and work (a man's work is never done)! So, it is hard to believe it is finally over. I was just telling Scott this morning that it is so nice not checking the e-mail, looking for a note from our attorney to find out if court has happened for a parent, or if it's time to travel, etc. etc. The uncertainty and stress of that is now finished. Now we can work through the stress of having a teen-ager and one soon to be! Gertrude has a very sweet spirit and she has a natural love for and interest in God. It is wonderful to see. She even reads her Latvian Bible on her own sometimes. She has been asking when she can get baptized, and we explained everything to her as far as what Jesus says about baptism. Her birthday in September is on a Sunday this year, and she wants to get baptized on her birthday. She thinks that will be nice to have two "births" on the same day. She and Tena do great together and Tena is a wonderful big sister. We are so proud of how well she plays with Gertrude and how patient she is ( she loves Gertrude very much but she is "little sister" after all) and little sisters sometimes require big patience! Tena has shown great responsibility and maturity regarding her big sister role and in other areas as well. We are blessed with two beautiful and special daughters. Thanks again to all of you who have been supporting us in many ways throughout our whole hosting/adoption process. We have finally seen and are experiencing the light at the end of the tunnel! Gertrude and I got back from Latvia on Sunday, March 9 about 2:00 a.m. Everything went fairly smoothly, except the trip over. We were supposed to travel Atlanta to Frankfurt, then on to Riga, Latvia. There was a bad storm in Frankfurt at the time we were supposed to land and they closed the airport. We landed in Cologne, Germany and waited about 2 hours to fly back to Frankfurt. Consequently, us, and hundreds of other people that were supposed to fly from Frankfurt to other countries missed their connections. We waited in line for 6 hours and 10 minutes, knowing there were no more flights out that day to Riga, and wondering if we would even get on one the next day. I had to get hold of Scott but had no way of calling (the cell I had only works from Latvia). I needed to let the hotel know we would be a day late and let Scott know so he wouldn't worry. Scott was actually out of town too, and Tena was home with our neighbor Emilia that stayed with her. So, finally found a phone that could be used to call internationally by using a credit card. I called Scott and told him the situation, and he called Tena and had her e-mail the hotel and our attorney to give them an update on when we would be there. Thank you modern technology!! Of course, once we got home and got our credit card bill, we found that those two 5 minute phone calls cost us about $65.00 each! Anyway, we finally got to the front of the line and got a ticket for the next morning. They put us up in a nice hotel not far from the airport and it included dinner and breakfast. We got to shower (and boy did we need it!) and rest, and I was able to get internet access and e-mail people in Latvia to let them know what was happening.Once there, we got our hotel which was a decent place but 6 floors up (circular stairs) with no elevator. We got a lot of exercise while staying at this place! Monday we had to take Gertrude to the Embassy doctor for a physical, and then get her new passport. Our attorney took us back and forth to the doctor and passport office (had to return to pick up the passport, bring it back to the doctor so 2 trips for each). Then she took us to a photo shop to get Gertrude's visa photos. So, basically we were finished with all the paperwork that had to be done. On Monday evening we went out to dinner with the Children's Home director, and our friends Ilga and Helen, along with about 10 of Gertrude's friends and her sister. Many of her friends brought gifts for her, games and stuffed animals, and the director brought a photo album they put together for her. It was a wonderful celebration but a sad good-bye. Since everything was done on Monday, I called the Embassy and moved our appointment up to Tuesday from Wednesday. We dropped off all the documents and had to wait till the next day for the visa. That night we had dinner with some of our adult friends again, and Gertrude’s sister. This was the last good-bye for the two girls. I’m really glad they got to spend that time together. The following day the visa was ready and we picked it up. Once we had the visa in hand, Gertrude was very happy and asked, "Now I'm your daughter?!" A very sweet moment! Since we had the visa, that means we were completely finished and ready to go home by Wednesday afternoon. Unfortunately, to change our tickets would have been about another $1,000 so we opted to stay till Saturday anyway. On Thursday we went to Big Lido and went ice skating and had lunch. It was fun and it snowed the whole time we skated. It was like a winter wonderland out there, very enjoyable. Then we had lunch there and went back to the hotel. Friday we didn't do much, just walked around and went into some shops. Saturday we were on a plane (actually 3 planes) for the long trip back. We were both so happy when we were on our last flight. Gertrude said she was so happy and she just wanted to sleep in her nice soft bed. I have to say, my sentiments exactly! Wow, how long have we waited for this news? On Jan. 21, Scott attended district court in Latvia for finalization of the adoption. She is now officially Sarah Gertrude Murphy. Gertrude and I still have to go back one more time for her to go through immigration. We leave Feb. 29 and return March 8. Then it will truly be done. She will be a citizen, can attend school, etc. We are all so happy and she is doing great. She is more comfortable and happy each day and adapting well. I am still homeschooling her and she learns very easily and quickly. I don't think we'll have any problems academically. She just started an art class and hip hop dance class and is adapting quite well to American life. This can be good and bad in some ways! She is anxious to start school but in the meantime I am checking into some homeschooling groups to help her meet some kids. She loves America and thinks the people are just so nice. So, we take one day at a time and so far every day is better than the next. God knew what He was doing when he laid this desire to adopt Gertrude on our hearts. We know this is part of His perfect plan. Can't wait to see what's in store next! Gertrude has now been here just over one month. This is longer than she has ever been here so it's sinking in she is here for good! It has been a great month, full of fun and rewards, and a few challenges. Overall she is adjusting extremely well, and Tena is adjusting extremely well with having a little sister. Gertrude has made friends with some of Tena's friends in the neighborhood, and they all spend a lot of time together. We went to one of their homes for a New Years Eve party and all had a good time. Christmas was a treat for all of us. It was great to watch the girls opening gifts together and giving gifts to each other. In typical Gertrude style she hugged and kissed her thank-you's, especially to Tena. Before Christmas both girls were counting down the days, and Gertrude would ask almost every day how many presents she was getting. It's so great to be able to give this to her. I know she did not have any such Christmas at the Children's Home. The last and best present we got for both of them was a Nintendo Wii. They were so excited, especially Tena who has wanted one for quite a while. Gertrude wasn't sure what it was at first, but then recognized it and was very excited also. They have both played it at a friend's house, and they have played it quite a bit since we got it. There are a few kids here from Lativa for the Christmas hosting, and Gertrude got to spend the night at her friend Veronika's. This was her first spend the night in America and she was very excited about it. When the kids are hosted, they are not allowed to spend the night anywhere without the host parents. But now she is a free agent, on a six month visa and no such rule! So off she went and she had a ball. She is spending the night there again this Friday, and then they will all go to a place where you can feed animals and they walk right up to your car and stick their heads in the window! I know that will be a trip to remember. Also, Gertrude got to have her friend Christina spend the night here once, and she will be spending the night there in a couple of weeks. When Gertrude first got here she called her sister and friend every day, her mom once or twice. As time goes on though, the calls are less frequent. She also talks like she is here for good now. She talks about school, about her name being Murphy (she is changing her name to Sarah Gertrude Murphy by the way). She is very happy and says so quite often. Scott will be going to Latvia for a January 21st court date which will finalize the adoption. Then Gertrude and I will go back the first week of March to have her Embassy doctor's appointment and get her new passport, visa, and birth certificate. Then we are done and it will be final!!! I started homeschooling her and will do so until the adoption is complete. Then we may put her in school for the rest of the year. I may join a homeschooling group for a short time so she can meet some of her own friends. Gertrude's English is absolutely amazing. You would never know that only just over a year ago she barely knew 5 words. You can actually have conversations with her and she speaks in sentences and knows a lot more than I even realize sometimes! Our friend Helen is here chaperoning the kids this Christmas, and she just saw Gertrude before we left Latvia. Only 3 weeks later when she spent some time with Gertrude here, she couldn't believe how much her English had improved already. From the way she picks up English, and from what I see when we do school together, I can tell she is a very bright kid. Gertrude loves to dance and may start dance lessons in January. She also loves art and drawing (and she is good at it too) so she might take a drawing class. We are loving our new family. Lots of girls, poor Scott is outnumbered between me, Tena, Gertrude and Allie, but he loves it! Both girls tell us now they want an older brother. No plans on our end for that to happen however! So, stay tuned...more to come later. We are back from Latvia..sorry it took me so long to update. Just lots to do with just getting back and Christmas coming up, etc. We had a great trip, not too long, and we were able to bring Gertrude home with us. Halleluiah! 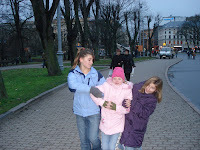 Our trip to Latvia was only for a one week custody period, but with traveling we were gone about 10 days. The Monday after we received temporary custody, the Orphancourt inspector visited us and asked us questions, then spoke with Gertrude alone about if she would like to come home with us early. She said she could come home early or stay. Once we told her she will be coming home early with us, her whole demeanor was different. She was good and sweet for the previous few days, but not very affectionate with Scott and me and would get mad easily if we teased her or told her something she already knew. After this news, she seemed to relax and felt comfortable getting close to us again. 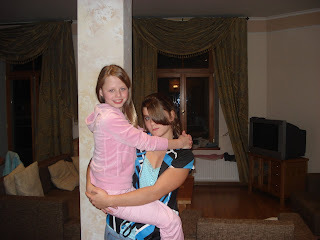 With Tena it never changes, she is close and affectionate with her always, just the parents that get dissed sometimes! Gertrude had a cellphone given to her by her mom, and every day she talked to her mom and her sister, sometimes friends. Gertrude sounded frustrated and impatient with her mom in most of the conversations and in one near the end of our trip she was literally yelling at her mom for about 5 or 10 minutes. We learned from the Children’s Home director that she has been getting a lot of pressure about the adoption from her mom and sister and I can only guess this was more of the same. I showed Gertrude several pictures of my side of the family. She saw a picture of my mom and she says, “she pretty” but that was her only commentary on the pictures. She and Tena spent a lot of time playing Game Boy and DS and we played cards, memory games, Uno, watched movies on the laptop. We had a lot of fun together. On Saturday we went to Big Lido, a large restaurant and entertainment complex with another couple in Latvia for court also, the Kannels. On Sunday we went to church with our friend Ilga Lasmane and the Kannels. It was very enjoyable but almost 3 hours long. Not quite used to that! We had headphones so we could hear it in English and it was a very nice and powerful service. The kids went to class and they were asked questions about family. Gertrude and Tena both drew pictures of Scott, me, Tena, Gertrude and Allie. That gave me some confidence she is thinking of us as her family despite all the confusion! We had a great time and afterwards we all went to this medieval style restaurant that was an actual building built in the 1500’s. They had no electricity and used just candles. It was an interesting experience! Scott ordered trout and it came with head, tail and all. He was more than a little surprised and wasn’t sure how to go about eating it! Once he started though, he said it was very good. I think I would have had to pass on dinner if that was my fish! On Wednesday, 5 days after we received custody, Gertrude’s dad showed up to the Orphancourt again. I don’t know what transpired, but it did not affect anything. Since his rights are terminated, there was nothing he could do. I have to admit though, when my attorney said those words, “her dad came to court” I couldn’t help but have fear strike temporarily! We had so much help from our friends there again, there is no way we could have done it without them. Helen Vipase and Ilga Lasmane were just there for anything we needed, to take us where we needed to go, to use their computer to type documents, talking to Gertrude about sensitive matters that we had trouble communicating because of the language, etc. We could never thank them enough. It made our trip successful and MUCH LESS stressful! On Thursday night we were able to have Helen Vipase and another friend Helen Grimshaw over for dinner. It was nice entertaining in our temporary apartment. The apartment is really nice though and very efficient so it was quite easy to do and we had a very nice time. When we found out we could bring Gertrude home with us, we had to book her a flight and there was no more room on our original flight for her. So, we had to change mine and book Gertrude with me. We all left on Sat. Dec. 1 but our flight left at 6:00 am and Scott and Tena’s at 9:00 am. We had some trouble getting our ticket e-mailed and finally had to call my mom to help us contact Travelocity and handle it for us! It was tricky calling from the coffee shop on the computer, hard to hear, agents with heavy accents, on hold forever, etc. My mom was a lifesaver! Friday night Helen took us to Gertrude’s Children’s Home to pack and to say good-bye. The children’s home is quite nice, not what one might expect. The walls were colorful and the kids’ rooms were nicely furnished. Of course, it still has that institutional feel and it’s communal living so not quite like home. Saying good-bye to her sister was hard. She is having a very hard time with this adoption of her sister for many reasons I think we can’t even understand. But, it is best for Gertrude and I think she will realize that one day. The girls had their dance class that evening and Gertrude begged to be able to participate one last time. So she did and we got some video of it. It was wonderful..it’s hip hop but the dancing was a bit different than the hip hop style here, at least different from Tena’s class. Gertrude was very good though and she loves to dance. In fact, she asked if she could take a dance or drawing class when she gets to America. The Children’s Home director, Ilga Grintale, gave me a couple pictures of Gertrude when she was about 5 years old, and Gertrude has one of her and her dad when she was about 1 or so. But, those are the only “baby” pictures we have of her. I hope we can get hold of more before this is all finished. So, getting to the time when it was time to go home..We had to get up at 2:30 a.m. to take a cab to the airport at 3:30. I woke up at 12 with a scary thought. The paper from the court authorizing Gertrude to cross the border out of Latvia said she can cross with Scott and Karen Murphy. But, she was only crossing with me. I was so worried this was going to cause a problem and that I would be stuck there another few days, have to go back to court to have them draw up another document. The apartment we were in was also rented out the next day so I was thinking I’d have to find another place to stay. I could not get back to sleep! At the airport the next day, the guy at passport control literally read the entire document. I stood there for a full 5 minutes thinking he’s going to ask me why Scott is not flying on this flight. He never spoke to me, never cracked a smile. But, when he was done reading it, he handed it back to me and waved me through. Whew! What a relief that was! The flight home wasn’t bad. Gertrude and I had a good time together and we played Uno and cards, a memory game and Word Find. She is excellent at word find and really likes it. She spent hours doing that on the plane and during our 4 hour layover in Czechoslovakia. A few times on the plane, Gertrude expressed excitement about coming home. She did call it “home” and she would clap her hands and say “I am so happy, or I want to see my room, or Yeah! tomorrow we get Allie (our dog)" She also talked about how she likes our house, “not children’s home.” When we got home she already unpacked and tried on a bunch of clothes that a neighbor had given us for her. Since she’s been here she has called her sister and friends every day. She wanted to call her mom today but the number must have been wrong because it didn’t work (I swear I didn’t sabotage it!!) She misses her family and friends understandably, but so far she is also having a blast here. In fact, Tena, Gertrude and Tena’s friends from the neighborhood were just jumping on the trampoline (there were 5 other girls here). Then they all wanted to walk down to the cul-de-sac where all of those girls live and play down there. Tena does this all the time with these kids. Gertrude asked me if they could go, practically begged me really, “please mom please.” So she is fitting right in and we couldn’t be more happy! It’s funny to see how things are different here and what Gertrude is used to or not. I turned the garbage disposal on this morning and she gets this puzzled look on her face and starts looking around the dishwasher for what that noise was! I showed her how the disposal works and she wanted to put her hand down it! Things we just wouldn’t think of as new experiences. This Saturday we are having her Latvian friend Christina over to spend the night. I think that will be really special for both of them. 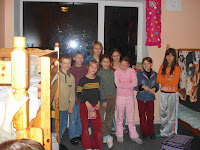 Then, on Dec. 18, the kids from Latvia come over for the Christmas hosting. Gertrude’s very good friend and bunkmate Veronika will be here, and a couple other kids from her Children’s Home and Helen Vipase is chaperoning. So, she will get to see more friends again already. We are not going home to Michigan for Christmas for the first time ever, and I am disappointed about that. But, it’s just hard with another Latvia trip coming up probably right around Christmas, and Gertrude being new here still, her friends coming into town, etc. I think it’s best if we just spend a nice quiet Christmas together, just the four of us, then pick the tradition back up next year. Today (Tuesday) was my first day alone with Gertrude. Tena went back to school and she and I stayed here. We had a good time, doing her typing program, jumping on the trampoline, we took Allie for a walk. Gertrude is doing great with the typing. She is extremely diligent and persistent. It wouldn’t surprise me if she was typing 25 wpm in no time! Presently she does about 7 wpm. Tomorrow we start Homeschooling. I will homeschool her until the adoption is final and then she will start school after that. So, that about wraps it up. We can’t wait till it’s all final and done. Even though she is here and we are blessed, it will be nice when it’s finished! We got another letter from Gertrude. We've heard more from her the last 2 months than we have the last year! It was short and sweet and she addressed it to all of us, including our dog, Allie. She told us she misses us so much and loves us and wants to come live with us as soon as it is possible. She also said her sister loves us so much and Veronika (her friend that was here this summer) loves us too. After reading this letter, we definitely feel very loved! After she signed it "with love" she added that she will wait for our letter. I think she likes getting mail from us. Better get another one out. Maybe she'll get it before we get there (I think the mail takes about 2 weeks to get to her). That's about it. We are getting ready for our trip, making sure we have all we need on our computer, that we have a phone chip, etc. Won't be long!